Pianist Ramon Rabinovich began the festivities with an explosive reading of three movements from Stravinsky’s Petrouchka. Using every ounce of strength and leveraging his strong shoulders, the decibel count in some sections wouldn’t be much less than the fully orchestrated symphonic version. He also displayed a well-honed technique and sense of drama. “Chez Pétrouchka” was especially effective. My third sitting this summer season of Chopin’s Scherzo in B-flat Minor began the second half (following on the previous performances of Arthur Rubenstein in 1957 and Maurizio Pollini in 2009 is especially humbling and, hopefully, prophetic for the fearless pianist). In many ways, this version was the happy combination of an even younger artist in Niagara (barely 12, but already showing considerable skill and sense of line) and a more experienced artist in Ottawa (cross-reference below). Rabinovich was extremely secure in working through wave after wave of cascading notes and deftly letting the silences reinforce them. With such obvious talent, the artistic bar could be raised a couple of notches higher. Slightly adding a touch of weight to the heard but seldom seen pulse would go a long way in solidifying the musical lines in both Stravinsky and Chopin. Too often the downbeats that appear in the score are taken for granted or lost when presented. Do the phrases begin on the beat or do they lead towards it? The ever-elusive gold of the extreme top register is frequently breathtaking from Rabinovich in the quieter moments. If that same quality can be found when required to soar above the heights of fortissimo, then a truly great performer will emerge. Currently, those moments are more strident than the epitome of ring, but, to be fair, few pianists have ever successfully combined the twin colourings. 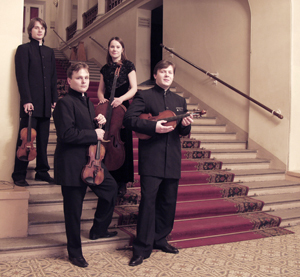 Borodin’s Second String Quartet was given a passionate, if occasionally tight (the second subject of the “Notturno,” for example) performance by the engaging Atrium Quartett. A more aggressive approach from violist Dmitri Pitulko would help solve the balance problems. Earlier in that movement, cellist Anna Gorelova introduced the famous melody with discretion, care and beautifully controlled legato. Responding in kind, violinist Anton Iluyunin wasn’t initially as certain with the pitch, but soon settled into an equally heartfelt reply. A real highlight was the ensemble’s collective warmth in the closing section of the Finale, following a well-spoken conversation 2 (violins) by 2 (viola/cello) and a pitch-perfect unison. Moving up to the balcony after the interval provided a wider view (both visual and aural) of the Franck Piano Quintet. Here, Rabinovich demonstrated a fine ability to become a team player, knowing just when to lead or follow, listening to everything that was swirling around him. With Alexey Naumenko now in the first chair, the music had a bit more edge and smartly matched bows. Once again, the absence of consistent pulse gave a few moments of “in the cracks” ensemble; the vital skill of breathing as one, combined with the previously mentioned weight in the lines are all that’s required to lift this level of music making from good to great.